Today B, Mel, and I went for a walk. 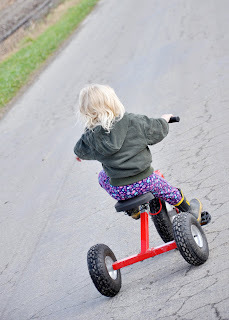 B rode her big wheeled bike(a must for anyone living in the country!) 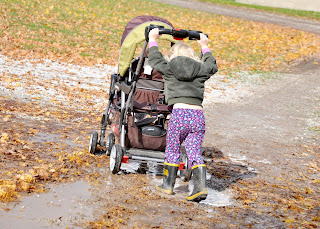 and I pushed Mel in the stroller. 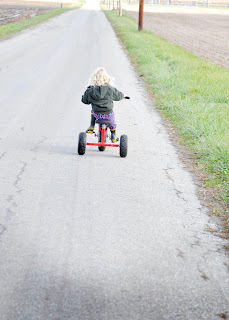 We walked quite a distance and when we got to the driveway, B decided she couldn't pedal any further. 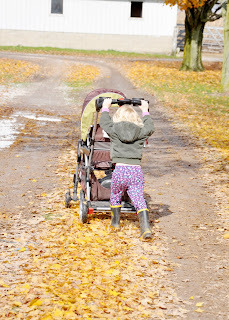 So I carried the bike and B pushed the stroller. I snapped this photo of Brad today. I thought people might like to know what Brad has been up to. He has been in the fields harvesting the crops, in between rains. 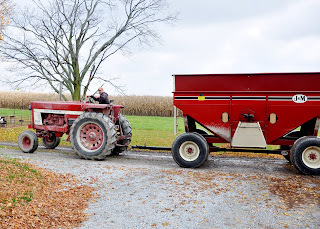 It rained yesterday, so he and Eric ( my cousin who is currently working for us) hauled dry corn to fill the bins at our house, so they could make room for wet corn in the other bins. If you aren't a farm person, you probably didn't understand a word I just wrote. Sorry.